Pressure cook toor dal till its tender. Set aside. Heat oil in a kadai. Add mustard seeds, methi seeds, hing, urad dal, and curry leaves. Once seeds starts crackling, add onions, tomato and sambar masala. Fry till onions turn a little brown and add the boiled dal. Add salt to taste, tamarind juice and a little water. Cook with covered lid for 15-20 mins. Serve with dosa, idli, vadas or appams. Tip:You can add lemon juice instead of tamarind juice. 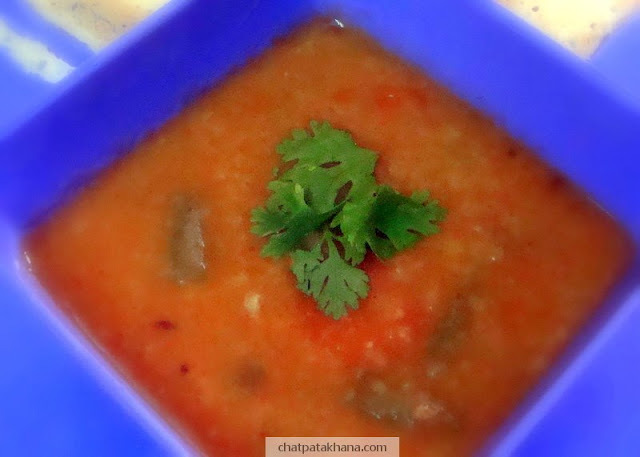 You can also add vegetables like sambar onions, beans, drumsticks and carrots to the sambar.